the vilafonte wine blog: The Big Apple media tour. The Big Apple media tour. After 2 weeks of enduring hurricanes, heat waves and almost 100% humidity, we were delighted to wake up to the first relatively temperate day of our tour. The humidity was down and the temperature had retreated to a moderate 28°C which was a relief. Today will be the biggest day of our tour.The majority of the US media and specifically wine media are situated in and around New York State. We arrived for our first meeting with Ray Isle, the senior editor of Food and Wine magazine whom I have known for some time. Ray had previously been editor of Wine and Spirits magazine and was thoroughly enjoying his new, all-encompassing gastronomic endeavors at F&W. We were joined by the energetic and vivacious Lettie Teague, the executive wine editor and Anna McDonald, her wine assistant. Our presentation and tasting were presented in their makeshift boardroom. F&W is part of the American Express publishing group and the entire building was in a state of flux as major renovations were underway. The wines were well accepted and we were peppered with a number of questions and observations. Our pre-lunch meeting was uptown on the Upper East Side as we raced up Madison in a taxi driven by a man who felt the world owed him a favor (US spelling!). After our positive experience at F&W, we were too exhilarated to be perturbed by the endless stream of expletives and cursing by this man as he narrowly avoided the temptation to mow down anything in his path. A trip in a NYC taxi is something that everyone should experience at least once in their lifetime! We reached the Sherry Lehman (www.sherry-lehmann.com) offices in one piece and were welcomed into this (seemingly) tiny fine wine store by the two owners who have been driving this company for so many years. Sherry Lehman is one of the most powerful direct sales companies in the world and certainly one of the most respected in the United States. With the ever changing legal environment in the US, the scope of their power and the reach of their sales are growing on a daily basis. When Sherry Lehman send out a catalog, it goes to a couple of hundred thousand households and also gets inserted into the New York Times! These guys know their stuff and their catalog contains thousands of wines and is upwards of forty pages thick! This is the coalface of fine wine sales in the US. We are happy to have secured a listing for our wines and, after tasting them, we plan a course of action for maximum effect. Zelma will return to the SL offices in November after Thanksgiving weekend for a customer tasting to reinforce the catalog and online marketing efforts. Our next meeting is on 22nd Street, at least half an hour by taxi, and we arrive late (again) for lunch at the Grammercy Tavern with Joshua Greene. Josh is the publisher/editor of Wine and Spirits magazine (www.wineandspiritsmagazine.com) and one seriously nice guy. W&S is one of the most powerful trade publications in the US with an enormous readership. He is inquisitive and exploring and delves deep into the Vilafonté philosophy. We also meet with Juliette Pope who is the wine buyer for Grammercy who asks if she can list the wines to which we eagerly acquiesce. Josh and I both ordered the seared salmon which is cooked like only the New Yorkers can . crispy on the outside and barely warm on the inside - delicious. After lunch we are late again and we race by taxi to Grand Central station to catch the train to White Plains, about forty minutes North West of Manhattan. From there we catch a cab to Elmsford, the home of Wine Enthusiast magazine (www.wineenthusiast.net), where we actually arrive on time. We are welcomed (see picture) regally with our names on the sign at the front entrance. We are met by Joe Czerwinski who is the senior editor and tasting director and given the grand tour of the sprawling WE offices. We are also pleased to meet with Daryna Tobey who has recently written an amazing in-depth article on the Adelaide Hills. Mike Duffy, the debonair tasting administrator leads us into the beautiful board room and we spend the next two hours presenting the wines and the project in its minutiae. It is always a pleasure presenting to professionals that are truly interested and the time flies. Our taxi driver arrives early and is forced to wait an hour for us outside. 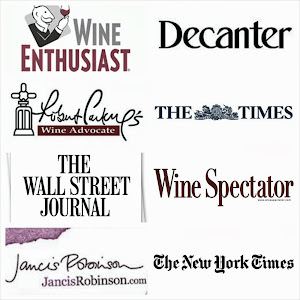 It is almost sad to bid farewell to Wine Enthusiast, but depart we must. It is also time for the Vilafonté partners to go their separate ways after two weeks of being joined at the hip. It sounds as if everything is going quite well! Don't you just love the cabs in NYC?! Your hard work will soon pay off and perhaps already is! I love all your taxi comments! I have the NY cab story to end all cab stories. To cut a very long story short, the cab driver was so dangerous [hitting the sides of the tunnel en route to JFK, switching highway lanes without looking in his rear view mirrors or taking his eyes off the lane ahead, which he was not even good at staying in] and clueless [we got lost going to the airport] that, eventually, I insisted that he stop and let me drive. I was so crazed by then, I guess he figured his passenger was potentially more dangerous than his own driving, that he did stop and I drove the cab!!! I think it was the first day he had ever driven, probably borrowing the cab from an off duty friend. Anyway, driving a NY cab is something everyone should do once in their life time! But, getting so frustrated that you can intimidate a NY cab driver into letting you drive, is not a personality trait that anyone could take pride in possessing! and I found your website. The Big Apple media tour. Recently I found a great online store Wine Enthusiast at CouponAlbum shopping site which is full of good quality wine products with lots of online coupons & deals.....! Vilafonte listed at the French Laundry!! Pennsylvania, New York and New Jersey in one day!